From left; front; Tod Gugino; Matt Hester; Jeff Heerdt; Todd Schuiling; Chip Henry; Dan Gustad; and assistant coach Gregg Afman; back; head coach Glenn Van Wieren; Dave Beckman; Steve Majerle; Scott Gugino; John Klunder; Scott Gelander; Jeff Dils; and manager Joe Lyons. Hope College will honor the 1983-84 men’s basketball team on Saturday during the Holland Sentinel/Russ DeVette Tournament at DeVos Fieldhouse. The 1983-84 team, which recorded an undefeated regular season, will be recognized at halftime of Hope’s 3 p.m. game in the Sentinel/DeVette Tournament. Fans are invited to meet with team members before the game from 2:30 to 3 p.m. and after the game. Ten of 12 players from the 1983-84 team will be in attendance, former Hope men’s basketball coach Glenn Van Wieren said. The late Tod Gugino will be represented by his wife, Brenda. Hope welcomes Illinois Wesleyan, Lake Forest, Ill., and Wilmington, Ohio, for the Sentinel/DeVette Tournament. Friday’s games feature Hope against Lake Forest at 8 p.m. and Illinois Wesleyan against Wilmington at 6 p.m. Saturday’s games are 1 and 3 p.m., with Hope playing at 3 p.m. no matter Friday’s outcome. 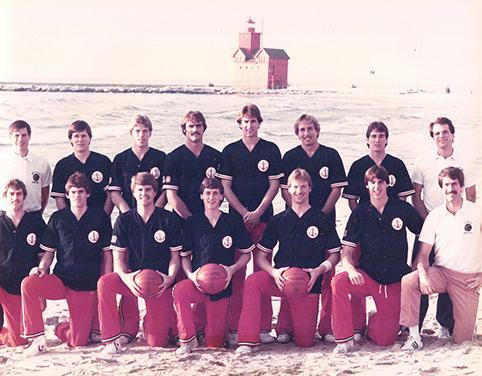 Thirty years ago, the Flying Dutchmen finished with a 22-2 overall record after going 22-0 during the regular season to set a school record for consecutive wins. Hope was ranked No. 1 in the country for eight consecutive weeks. The Flying Dutchmen also claimed their fourth consecutive Michigan Intercollegiate Athletic Association (MIAA) championship. Hope was the last undefeated team heading into Great Lakes Regional play in the NCAA Division III Tournament. Forward Chip Henry of Kentwood led the Flying Dutchmen in scoring (17.0 points per game) and rebounding (8.2). Three teammates also scored in double figures — center Jeff Heerdt of Elmhurst, Ill., at 11.8, guard David Beckman of Shelby at 11.5 and forward John Klunder of Grand Rapids at 11.3. Hope outscored opponents by 17 points per game that season. Other 1983-84 team members coming back to campus are center Jeff Heerdt, guard Todd Schuiling, center Dan Gustad, guard Jeff Dils, guard Scott Gelander, forward Scott Gugino and guard Steve Majerle. Forward Matt Hester will not attend due to family commitments. Heerdt and his teammates are looking forward to the reunion. The Hope men’s and women’s cross country teams have presented their team awards for the 2013 season.